I love a good Macaroni and Cheese. The problem is, like potato salad, I am very particular about my Mac & Cheese. I like it creamy, but not soupy or goopy. It should be thick enough to stand up a fork in it, but not gritty or grainy. It's not easy to find a recipe that lives up to my expectations, but here's one that I finally found that is just amazing. The best recipe for Macaroni and Cheese that I've made so far is the one recently published in Cook's Country Magazine (in the April/May 2007 issue). The texture is simply amazing - smooth but not runny, cheesy but without clumping or separating. The recipe is more complicated than most, but in order to achieve the ultimate mac & cheese, that's what it takes. 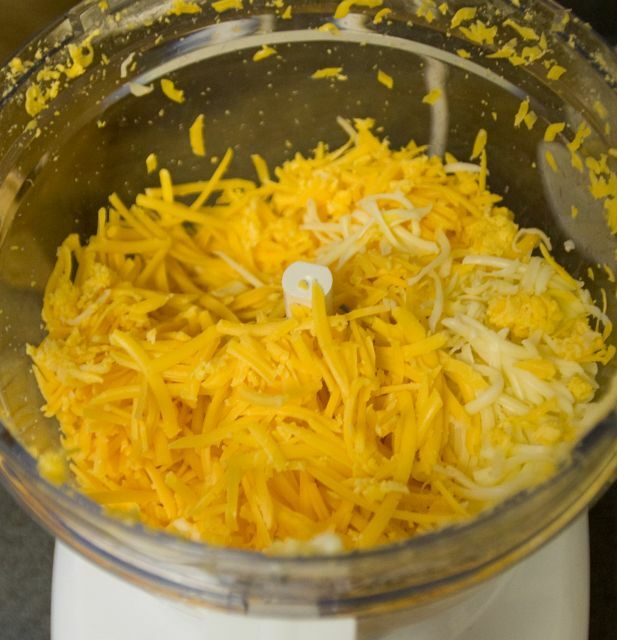 The recipe utilizes three different cheeses: American cheese (for stability - American cheese has stabilizing ingredients), Monterey Jack cheese (for creaminess), and sharp cheddar (for flavor). (A fourth cheese is actually used - Parmesan - to flavor the bread crumb topping!) To keep the cheeses from breaking, evaporated milk (which contains carrageen or other stabilizing ingredients) is used instead of milk or cream. 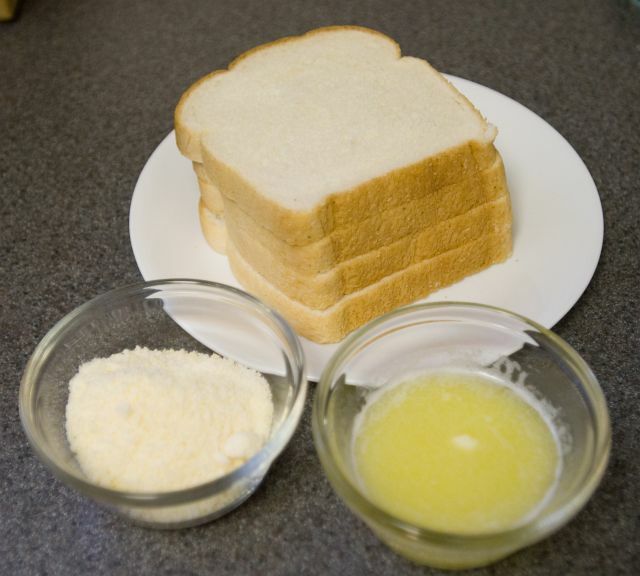 For the bread crumb topping, use 4 slices of white sandwich bread, 4 tablespoons (55 g) melted butter, 1/4 cup (35 g) grated Parmesan cheese. The rest of the ingredients needed are 5 Tbs. (45 g) all-purpose flour, 1 lb. (450 g) elbow macaroni, 3 12-oz. cans (1 L) evaporated milk, 5 oz. (140 g) American cheese, 8 oz. (225 g) extra sharp cheddar cheese, 3 oz. (85 g) Monterey Jack cheese, 1/8 tsp. (0.3 g) ground nutmeg, 1 tsp. (3.3 g) ground mustard seed, 2 tsp. (12 g) table salt, 4 Tbs. (55 g) melted butter, and 1 teaspoon (5 mL) of hot sauce. Bring four quarts of water to a hard boil. Dissolve at least 1 Tbs. (18 g) table salt into the water and add the macaroni. Cook until al dente (when the macaroni no longer shows white in center of the pasta when you bite into it but still has chew). Check the instructions on the package of your macaroni product and use the time listed as a guide. I generally start checking the macaroni a minute or two early to make sure I don't over cook it. 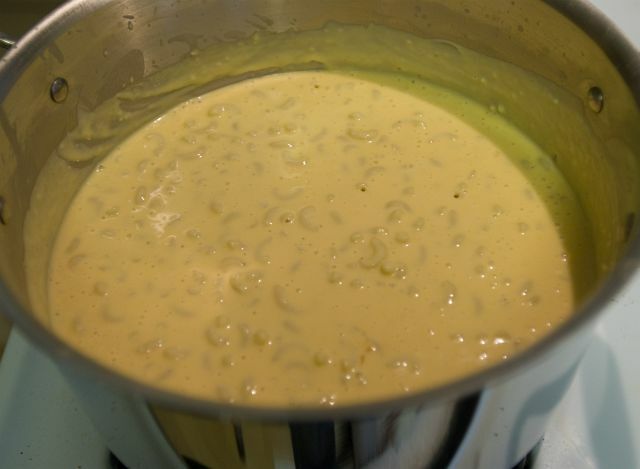 Once it's ready, ladle out 1/2 cup water to be reserved for the cheese sauce later. Immediately drain the macaroni and rinse it thoroughly in cold water to stop the cooking. This is one of the few times I advocate using a colander and rinsing pasta with cold water (in most cases, pasta used in casseroles benefits from this procedure). Break the sandwich bread into chunks and pulse in a food processor with 4 Tbs. of melted butter and the Parmesan cheese until bread crumbs are formed. Set aside in a bowl for topping the casserole later. Shred the American, Monterey Jack, and cheddar cheeses. I found this was done fastest by using the grating disc on my food processor. 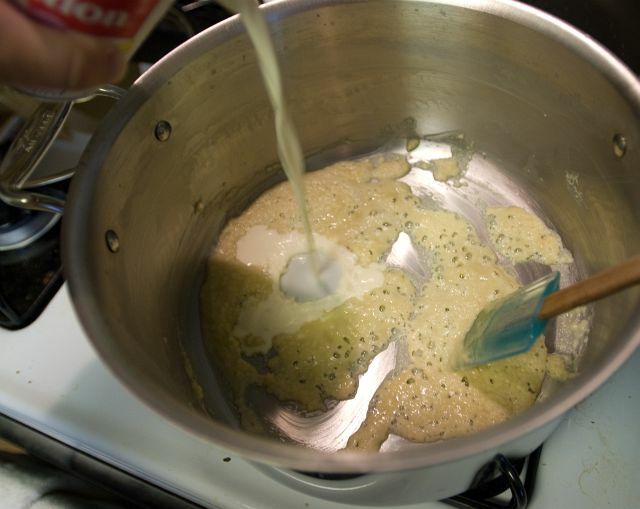 Prepare a roux by heating (over medium heat) 4 Tbs. butter until it foams. Then stir in the flour and cook while stirring until light brown (about 1 minute). 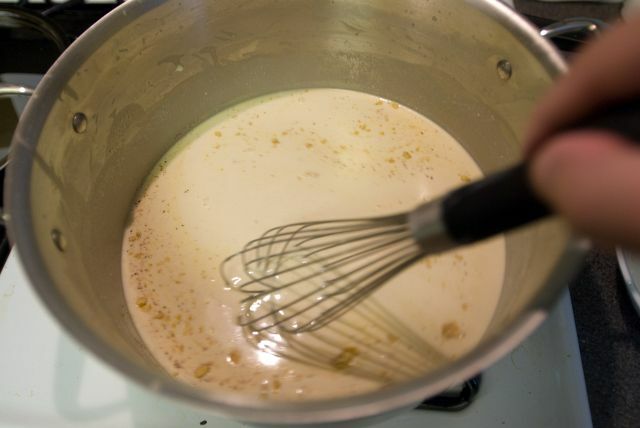 Slowly add evaporated milk while stirring until all the evaporated milk has been added to the pot and no clumps of roux remain. Stir in the hot sauce, nutmeg, mustard, and salt. Cook the mixture for about 4 more minutes on medium heat. The mixture (a béchamel sauce) should have thickened up. 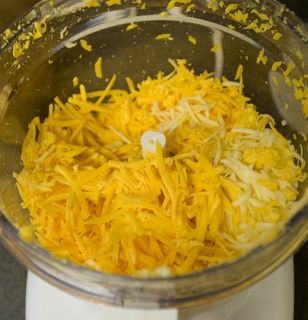 Move the pot off the heat source and stir in the grated cheeses and 1/2 cup reserve water. 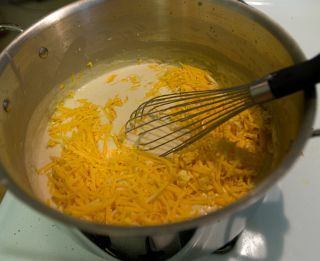 Keep stirring until the cheese completely melts into the bechamel. Stir in the cooked macaroni so that the sauce completely coats all the pasta. Pour the macaroni and cheese into a 9x13-in. baking pan. 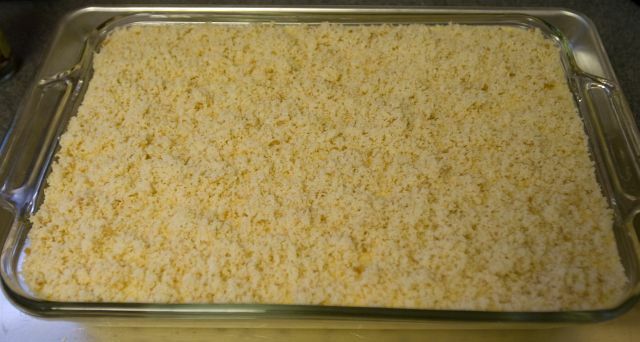 Cover the top of the macaroni and cheese with the bread crumb mixture. Bake for 25 minutes (when the edges begin to bubble). Remove from the oven and let the casserole sit for 5 to 10 minutes before cutting into it to serve. 4 Tbs. (55 g) melted butter cook while stirring until light brown (1 min.) stir in slowly stir in remove from heat when thickened (4 min.) stir in until melted stir in until coated pour into 9x13-in. pan top bake 25 min. 350°F (175°C) let rest 10 min. Subject: Baking at 120C would not be ideal!!! Subject: Mac and cheese Toast? 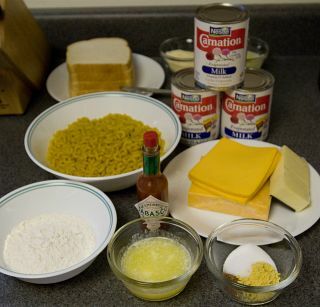 Have you tried Alton Brown's recipe for mac and cheese "toast" with this recipe? I think it actually might be immoral to produce these. I've never done it myself, but I'd sure like to know if you've tried it and if it was good. I think it would take a very well-done mac and cheese to stand up to being fried into wedges. Subject: Re: Mac and cheese Toast? Oh wow, that sounds like it would be crazy. I'll have to make sure I have leftovers the next time I make mac & cheese so I can try this. For us Europeans, what is American Cheese with all its stabilizing ingredients? The Cheesecake Factory has fried macaroni and cheese as an appetizer...it's not all that great. 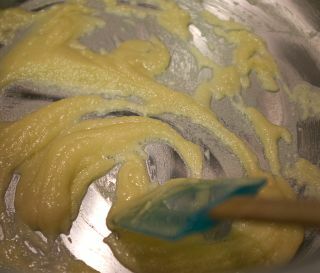 wisk together and pour between several layers of macaroni and slices of 1 lb ea. pepper jack and sharp chedder. Bake at 350 for 30 min or until it starts to bubble. Warm gooey and o so satifsying! I like it best with ketchup! American cheese is this coagulated milk based stuff. Here's an example: http://tinyurl.com/23y6wa You might try looking at some sliced cheese at an Aldi-like supermarket. In my experience, if it's real cheese, it doesn't have a list of ingredients. I think the consistency of the finished product is dependant on so many things: the flour, the water content of the milk, the water content of the cheese, the time in the oven, etc., so it would surprise me if the chemically goodness of the American cheese really is what gave the right consistency. Ever tried the mac and cheese at The Cheesecake Factory? It is about the BEST stuff I have ever had. I know they use parmesan in it as I can taste it. I am with you for consistency, though. I like it smooth but not runny nor grainy. Flavor is also important. Anyway, I was wondering if you tried the stuff at The Cheesecake Factory and how it compared? Regarding fried mac and cheese, yeah, I think that is a sin. Hahaha, I don't want to imagine what result that has on the bad cholesteral meter. Thinking about it makes my heart start constricting at the moment! OUCH! I think TGIFriday's sells the fried stuff, too! If you like a little extra flavor with your mac, try crushing cheez-it crackers for the top crust rather than bread. I've had fried mac and chz, and its definitely something to experience at least once. I'm not saying its the healthiest, but come on...read the name again...did you think it would be? I've also had Mac and Chz pizza. That was sinful. I heard that CiCi's had some, but there are no locations here, so I asked some questions about it, and built my own with homemade mac n chz. So good. I will add that my mother made everything from scratch. My husband had never had homemade mac and chz before me. What?! He's a convert. Though he still likes his Kraft. Someone asked about the caloric content of the mac and cheese. I was curious too and calculated it to be about 460-475 calories per serving (whick looks to be about half a cup). Definitely not for an everyday meal, but might be do-able for a holiday meal. it is usually called "Processed cheese" "Processed cheese slices" or just "cheese slices", or kind of like we refer to tissues as "Kleenex", we also refer to it as "Kraft slices" occasionally. Sometimes the slices are labelled "Cheese Product" too, because it is not really REAL cheese. I make my own recipe Macaroni & Cheese that's to die for... well it might kill you if you ate too much of it too often! LOL! I make homemade seasoned pasta. The cheeses I use are sharp cheddar, swiss, mozzarella, provalone, romano, asiago, cream cheese & parmesan. Other ingredients are milk, butter, flour, chipotle, dijon mustard, liquid smoke, worsteshire, bacon, salt, mixed peppercorn & trisquits. I made this for a Holiday potluck a few months back at work. It was definately a hit- the texture was creamy and the flavors were phenominal. I made a few changes- I used superspicy mustard and doubled the quantity to 2tsp, made the roux with regular milk, and added a touch of garlic powder to the bread slices while they were in the processor. All in all, it was slightly time consuming but totally worth it. I look forward to trying some of your other recipes! This mac & cheese was delicious! So cheesey! There is a restaurant that serves lobster mac and cheese near me and they serve it with sliced tomatoes on top. i added that to this recipe with a little extra grated parmasean on top. YUM! you should try it! Tremendous base recipe. I substituted a spanish sheep's milk cheese and a spanish cow's milk cheese for the recipe's called for cheeses while also adding slab bacon. I cook quite a bit, and this combination yielded the perfect mac'n cheese. Whoever posted the base recipe should win an award. I'm a long time experimenting 'personal chef' (for myself and friends) and I have, strangely enough?, never come across the little chart which you have at the bottom of your post. I love it! Years ago, my dear departed sister gave me a recipe for the World's Best Cheese with Macaroni. This recipe used the canned condensed milk, extra sharp cheddar, Jack, and Colby cheeses. 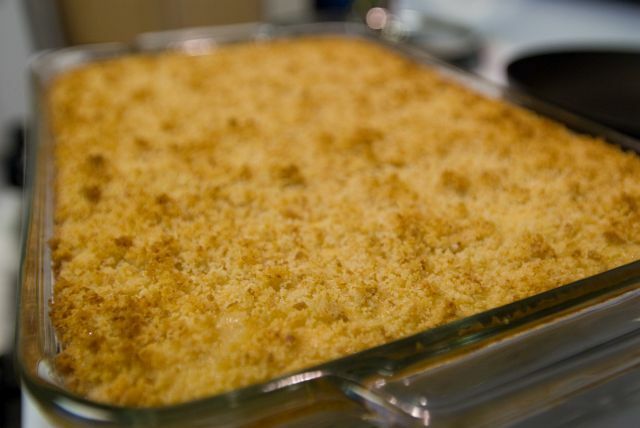 The topping was made in a similar way except that instead of breadcrumbs and butter she used the peanut butter cheese crackers! The peanut butter really enhanced the flavor and the canned milk made it richer. She also started with a roux and bechamel sauce, stirring in the cheeses till melted and then adding the macaroni. She used a buttered dish so it would not stick and baked it at 300, instead of 350. The biggest difference was she used roasted onion and roasted garlic in hers, which changed everything. Those little changes which make a dish special to one person can ruin it for another, so if you are going to try my changes, make sure you LIKE roasted onions and garlic and understand what changing the cheeses will do to the flavor. TIP: Most people do not like the peanut butter crackers idea, until they try it. So be sure you know what your tastes are before you 'ruin' your mac and cheese! I have found that Fat Free half and half (I can't believe I use it either, seems like a sin), 2% Milk Cheddar cheese, and a little Velveeta produces an amazing product. 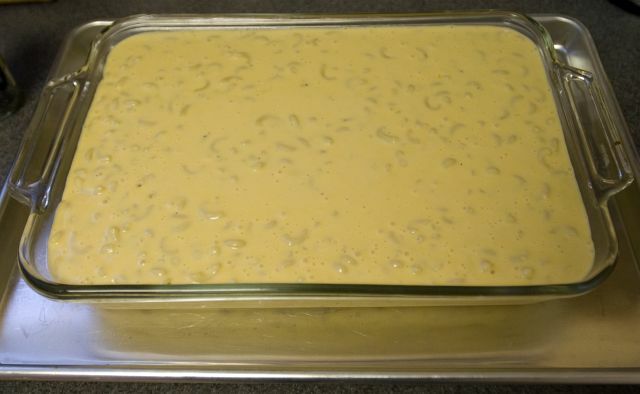 I make a basic bechamel the same as Michael, substituting all or part of the milk (usually 1-2%) with the FF half and half then add the cheeses as directed. It definitely wins over the kids and adults and is less fattening without tasting like it! I always saute a little onion, chopped fine, in the butter before adding the flour in the bechamel sauce.Dried mustard and a pinch of cayenne pepper also give it some zip! I would like to try to prepare this dish ahead of time for a holiday dinner. Any suggestions? Can it be prepared, frozen or refrigerated and then baked later? if you're talking ahead of time for Thanksgiving, freezing is not a good idea at this point. but yes it does well when made ahead BUT the cooling / reheating will make the sauce a bit thicker - so make it extra runny at the outset to compensate. 8 ounces in a cup. 2 Tablespoons in an ounce. ounces (volume) is not convertible to ounces (weight) unless it's water or something of similar density. On Cooking For Engineers, we try to use ounces ONLY for volume to reduce confusion. All weight/mass is shown in grams. At the top of the page is a conversion text bar - just type in something like "5 ounces in cups" and hit Convert. We have "half cup in milliliters" in there by default as an example. 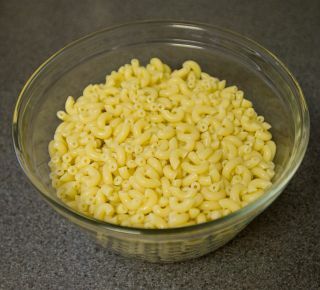 I've found cavatappi to be a better noodle for mac-n-cheese. It's larger and holds the cheese better than elbow macaroni. I also like to saute about 5 diced onions and line the bottom of the pan before adding the macaroni mixture. Adds some great flavors! Wonderful! This recipe was great, best MnC I've ever eaten, and got rave reviews from all my guests. Truly a keeper of a recipe. I subbed italian bread crumbs for the bread, which was easier and tasted delicious. I think I used around 1.5C, but I'm not sure. If you are cooking for children, you need two additional ingredients: Yellow #5 and Yellow #6. To them, it just isn't mac 'n cheese unless it's the same color as the Agent Orange that comes in the Kraft box. I tried the recipe substituting some leftover Fontina for American Cheese. I just couldn't bring myself to buying American Cheese. I did not have the right food coloring (and I didn't think that the kids would go for the leftover blue). My seven year old was VERY disappointed to find she liked it almost as much as the Kraft Krap. My four year old wouldn't touch at all. The adults, for whom flavor and texture actually mean something, though it was great. Subject: Best Mac and Cheese ever. Thanks for posting this. I've tried a few of the recipes you've posted and have yet to be disappointed. This was excellent. OK stuff; nicely received by guests. Followed recipe to the letter. Actually, "American Cheese" had it's place. It melts much smoother than, say, cheddar, and it doesn't get oily and separate when melted. The Land O Lakes American cheese you get at a Deli counter is WAAAAAAAY better than Kraft slices. Doesn't even compare. I usually use saltines for the crust. Some mustard powder and chili flakes are great in it. I've always heard it got it's name from the way it was made to melt onto burgers and such... I could be wrong though, it's processed to no end, but unlike real cheeses it doesn't really drip off the burger it keeps together and more efficiently coats it. Eureka!!! Finally, the PERFECT mac and cheese! And fairly easy to make. We made this to go along with cold Alaskin king crab legs, roasted veggies and a green salad. Adults and kids gobbled this up. It's everything you want in mac and cheese; Creamy, cheesey (but not overwhelming) rich and oh so delicious. I've tried countless others but this recipe hit it out of the park! But if I make it again I will add about half the nutmeg...I found the nutmeg taste to be a little stronger than I would have liked it to be. I also doubled the topping and still didn't have enough to cover the entire pan. I would triple the topping if I were to make it again. Yummy though! I made this recipe and it WAS SO DELICIOUS. I was genuininely surpirsed that someting I made came out so good (because I'm not that successful of a cook). I used low fat, evaporated milk - White american, extra sharp white cheddar, and Colby Jack. Miam!! 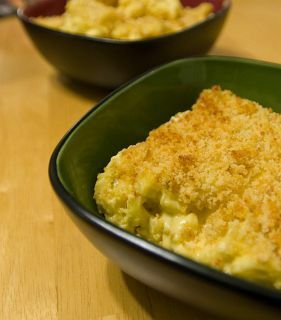 Looks like a good recipe...I love mac and cheese as well..Can't wait to try it!!! This week I make mac & cheese with ham for 100 . . . 2 lb butter, 2 c flour, 4 lb finely chopped onion, 8 qt 2% milk (actually 8 L), about 1/4 c Dijon mustard (could have used dry mustard, but no lumps), good dash of cayenne, 6 lb grated old Cheddar cheese, 10 lb cubed lean ham, 12 lb macaroni (6 servings per lb for main dish, 10 per lb for side). Topping: 2 lb melted butter, 12 c bread crumbs. Baked in 6 - 20x12x2" pans. Use the starch in the excess pasta water as a thickening agent. 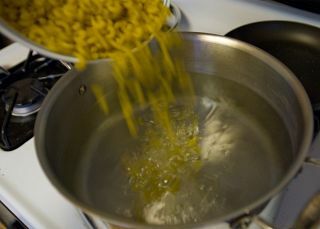 Reduce the amount of water accordingly (6 C. Per pound pasta). Also, velveeeta. I started using this recipe about 6 months ago. I substitute Velveeta for the american cheese, and always turns out wonderful. I've been making this for years now, but I change it up a bit. I replace one of the 12 oz cans of evaporated milk with 14 oz can of condensed milk (which adds a sweet flavor to it and probably a crap load of fat - but EVERYONE goes crazy over the salty sweet). Also, I was having trouble figuring out how to measure out the 5 oz of american cheese and the 3 oz of monterey jack, so I would buy the 8 oz shredded colby and monterey jack mix at the store. Sometimes, I add a shredded slice of american too b/c I always feel like you can never have too much cheese. haha. It comes out great every time. I'm sure if you follow the recipe to the T, it will come out just as fabulous. 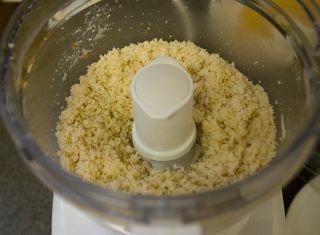 For the breadcrumbs, I usually cheat and buy plain breadcrumbs, then melt about 3-4 tablespoons of butter in a pan, sprinkle a little garlic and some Parmesan cheese and add the breadcrumbs, sauteing until they brown a bit. Good luck! mac&cheese is a comfort food that has more definitions and recipes than countable. not really. there 3-4 "basic prep" stages - all dumb&simple. once you've done homemade mac&cheese a couple times, it's like falling off a slow moving turtle - easy to do, doesn't hurt a bit. the only significant diff in "condensed" vs "evaporated" milk is the sugar content. which wheeze golly, I've never added sugar (or salt) to my mac&cheese, so no can comment to that. I've been know to sweat down minced onion in the melted butter before making the roux. I use dry mustard vs ground seed. I use cayenne pepper vs hot sauce. sometimes I do a bread crumb topping; other times no topping. pan toasted homemade bread crumbs - veddy good approach. for one cup of (dry pasta - about 120g) I use 6 ounces (170g) of cheese. aaahhh, should add,,,, liberally measured/scaled/seldom "under-weighted"
after getting real dang tired of "cheddar mac&cheese" I rather a bit overboard went working with 4-6 different cheese types. since then I've learned max three cheeses is more than "really good"
so, altho cheddar is almost always present, the (more or less equal parts) balance can be swiss, muenster, edam, gruyere, provolene, butterkasese, whatever... some melt better/easier than others - but I found even hard cheeses that want to string and not melt smoothly make duper dang good mac&cheese. so, just spread 'yer noodles and go fer it. Subject: This is my goto recipe! I use this recipe every time I need to take a dish to an event. I have modified it over the years, I now use half and half instead of evaporated milk and use Fontina cheese in once of the american, but the proportions are the same. Everyone loves it. Oh, also I use extra pasta water because we like it creamy. Thanks!